Order now and receive free freight! Every CONFAST® Carbide Tapcon Bits are in stock for immediate shipping. 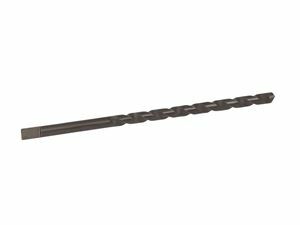 CONFAST® Carbide Tapcon Bits are used to drill a hole in masonry material for the Tapcon® or CONFAST® screw to be inserted. Every box of 100 CONFAST® or Tapcon® screw will be packaged with the correct diameter and length of CONFAST® Carbide Tapcon Bits. The CONFAST® Carbide Tapcon Bits are used in conjunction with the installation tool kit. The bit adaptor in the kit holds the CONFAST® Carbide Tapcon Bits by tightening a set screw against the end of the shank of the CONFAST® Carbide Tapcon Bits. The end of the shank has a flat side to allow for a strong, positive connection. 5/32" is manufactured in 3 three lengths: 3-1/2", 4-1/2" and 5-1/2". These bits will accommodate the hole length required for all sizes of the 3/16" Tapcon® or CONFAST® screw. 3/16" is manufactured in 5 different lengths: 3-1/2", 4-1/2", 5-1/2", 6-1/2" and 7-1/2". These sizes will drill holes for all sizes of the 1/4" Tapcon® or CONFAST® screws, including the 5" and 6". Dust removal is very important when drilling into masonry base materials. The dust must be removed at the same volume that it is produced, or drilling speed and hole tolerance may be affected. The length of the flute on the CONFAST® Carbide Tapcon Bits is equal to the maximum embedment of the screws. Use the search box if the item number is known in order to display the individual product page for that item. Click on the link and go to the product list. This list will display all of the CONFAST® Carbide Tapcon Bits that are available.